Marseilles/Barcelona 5th of September 2017 – Marseilles based COMEX and Barcelona based Zero 2 Infinity joined forces to launch stratospheric platforms from the sea. Zero 2 Infinity is one of Europe’s specialists in launching stratospheric balloons for scientific and industrial missions. COMEX is a pioneer in maritime technology and offshore operations. Both companies performed on Tuesday their first mission together. The main objective was to test the launch operations on COMEX’s vessel Janus. The launch was performed around 25km offshore Marseilles. The flight train had a length of 40m with a 15m diameter balloon that could carry a payload of 4kg. Its deployment was successfully tested at sea. A second balloon with a payload carrying a symbol of Marseilles—a model of Notre-Dame de la Garde—, a flag of Marseilles and one from Catalonia was launched to an altitude of 30km. The payload was successfully recovered from the sea 50km away. The balloons launched can reach an altitude of around 30km and can be used for testing equipment in Space conditions. They also can become a new way to access Space in the future. However, most of these balloons are launched from land, which comes under heavy restrictions and risks. Launching balloons from the sea has the advantage of compensating winds with the vessel during the launch and allowing a quicker and easier recovery. 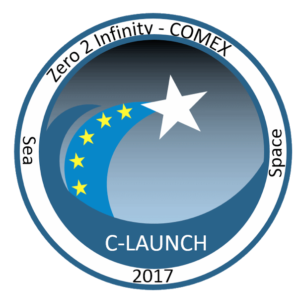 The C-LAUNCH mission is a first step in a closer cooperation between both Zero 2 Infinity and COMEX to launch stratospheric balloons from the sea. Apart from testing equipment in Space conditions, such balloons can also be used for Earth or ocean observation. 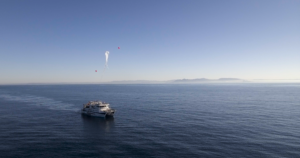 On Monday both companies kicked-off the Project Triton, which has the objective of developing a method to survey specific zones of the ocean with balloons. The system could be used in case, for example, of an oil spill or in areas with specific maritime traffic. The Project Triton is funded by the European Commission under the Neptune Blue Growth Accelerator call from the Neptune Project. Indeed, Triton is supported by the French Pôle Mer Méditerranée and the Cluster Digital (Catalonia Cluster). The project will be finalized with further sea trials in summer 2018. The Compagnie Maritime d’Expertises (COMEX) is specialized in engineering solutions for extreme environments, maritime and undersea operations. The company was created in November 1961 by Henri G. Delauze and became a pioneer in professional deep-diving operations. It still holds the record of the deepest human diving (-701msw in hyperbaric chambers and -534msw in open sea). It operates a fleet of oceanographic vessels (Janus, Minibex and Survex) and has a ROV capability down to 2500msw. The company is extending its activity from sea to space including projects on underwater astronaut training, space habitats, life support systems and space suits. Recently, COMEX performed hypobaric tests with human subjects in its Hyperbaric Test Centre in Marseilles. Zero 2 Infinity is a Spanish company that provides access to Space. It was founded by Jose Mariano Lopez-Urdiales in 2009 with a bold vision of making suborbital tourism affordable to everyone. In 2017, the main business is elevating heavy payloads to the Edge of Space for a variety of purposes, including scientific, educational, commercial, and communications. The next step for Zero 2 Infinity is to complete the development of Bloostar, a dedicated small satellite launcher to put satellites in low Earth orbit on demand. Moreover, Zero 2 Infinity has also drawn interest from international investors and corporations to develop a pressurized pod to take human beings to the Edge of Space for science and leisure named Bloon.